Sync'ing Your Browsing Experience on Mobile Devices — Mickler & Associates, Inc. In my consulting practice, I spend a great deal of time trying to show my clients how to securely access their email, contacts, calendars, and files on mobile devices. As a Google for Work Partner, I show them how Google Apps for Work anywhere, at any time, on any device. That's the benefit of working with an Apps Partner: Partners have the knowledge to ease the transition to cloud computing as well as the experience to make the most of it. One overlooked benefit of cloud computing is synchronizing the browsing experience. When you're using a browser on your desktop computer, you're constantly entering information. Over time, that information gets cached (stored) in the browser's memory so it becomes easier to re-enter that information. The data just pops-up when it's requested. Things like form fields (names, addresses, telephone numbers), user login names and passwords, credit card numbers, and the like. Users will also install extensions that enhance their browsing experience; users will create bookmarks and favorite websites within the browser; the browser keeps a running history of the last pages that were visited so you can easily go back to something that you were looking at earlier. All of these capabilities ease the browsing experience and extend a degree of convenience to the user. Well, why can't you take that experience with you? That's the idea behind Google Chrome. Chrome is Google's browser and it attempts to synchronize all of this information on any device that you use. On Android devices, Chrome is installed by default; on iPhones and iPads, Chrome can be downloaded from the App Store. 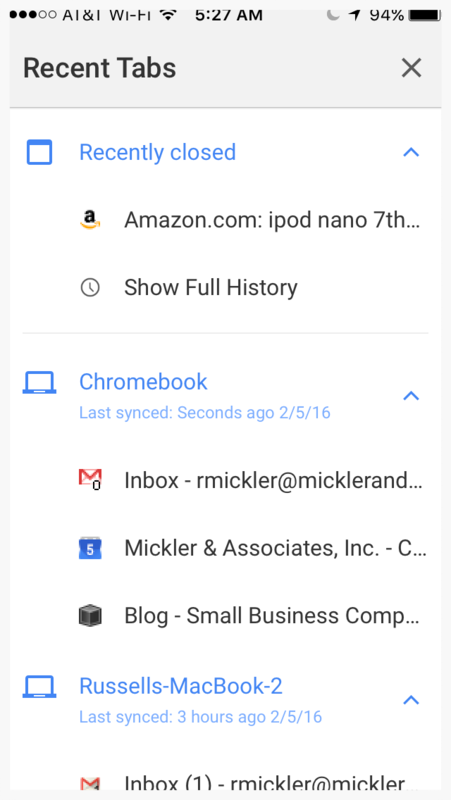 Once you sign in, Google synchronizes all of that data to your mobile device, and, if changes are made on the mobile device, those changes are shared to your other computers running Chrome. And don't worry: it's secure. This data is transmitted and stored encrypted on every device, and every user has the capability to remotely de-authorize devices and delete that data from their Google Account dashboard. Even better, as a part of Google App's Mobile Device Management (MDM) features, small businesses have access to implementing Chrome Cloud Policies that allow us to implement technical restrictions and rules for how web browsing and content is accessed within the context of an organization. So why do this browser sync stuff? Well, it saves time. It adds convenience. With MDM, we can increase security and reduce risk. It makes it easier to take the web with you. In the context of small business, it can reduce learning curves and training costs for using web-based applications because it distributes the same experience across multiple devices; it increases productivity; it diminishes the cost of support. Simply put, browser synchronization makes it easier to get work done. Want to know more? You're at the right place! Just get a hold of me - I'd be happy to answer your questions. Thanks for your time.